i have a lot of pet peeves in my life. they range from feet to people burping, and many more. one of my biggest of them all is.....copy cats. the wikidefinition of it is....A copycat (also copy-cat or copy cat) is a person (or animal, or computer program) that mimics or repeats the behavior of another. i know that most people like to use the excuse, oh it is supposed to flatter you. but most of the time to me, it makes me very mad. oh i don't mind when people that i like do it, like family or bestest friends, but a lot of people that bug me like to do it which bugs me even more. i'm not trying to be stuck up and say everyone copies me, but its true. jk. but doesn't it bother you guys when you do something to make yourself individual or it's just something you do and then someone copies it. ugh it irritates me...greatly. this summer has been excruciatingly boring. all my friends have jobs and such, and i'm too young. we don't leave for utah till july 13th. i'm way excited, but thats pretty far away. ugh can you die from boredom? i can't even go outside cause it's way smoky and super unhealthy. i can't blog about anything because there's nothing to blog about. how does everybody stay unbored during the summer. there's got to be a way to do it. this is pretty suckish. i bet you fell asleep while reading this blog. i would say sorry, but i'm not. jk. not really. oh my goodness i am FINALLY back!!! i am so glad to be home. i thought the week was only fun because i was a big sister (or ycl) and my little sisters were awesome they were so cute. big sisters and junior staff got to go to donner lake and go boating and stuff and it was so much fun. me and my friend and another girl went like extreme tubing. we were flying everywhere and i'm pretty sure i almost got whiplash, but it was so fun. it felt like i was there for months, but maybe just because i don't like camping. i didn't take any pictures because i don't have a camera, but the counselors of our little sisters took a bunch and she's going to email them to me, but idk when. I'm just going to get out and say it...I HATE CHANGE. but i suppose sometimes change can be a good thing, but it doesn't matter bc i am prejudice of it all. thing is, i need some change...mostly on my hair. i have had long curly blond hair probably since i was in the 3rd grade. i've been growing it out and cutting it back to the same exact way over the years. i now where it basically the same every day, 3-barraled and down. i have to wake up at 4:30 every day to do it before seminary during the school year. but now my moms been telling me how she wants me to cut it short, and that would've not even been an option, but now idk..i kind of want to. i absolutely LOVE kherington's hair, and i would like my hair to be like that, but my hair is kind of my security blanket. i love it when random ppl would come up to me and tell me how pretty my hair was. and at school when ppl refer to me to ppl who don't know me, they call me the girl with curly blonde hair. wat would i be if i cut it short? that girl with short blonde hair. which one? ahh...idk what to do. i really want to do it, but part of me doesn't want to let my old hair go. The Lakers Won!!! Whoo-hoo!!! They didn't play there best, but they pulled through, and made my day. 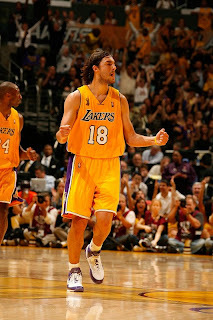 AND Sasha had 20 PTS!!! 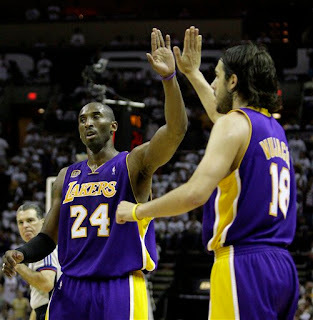 I just LOVE them Lakers!!! my new song on my blog is the call by regina spektor and its from the narnia movie and i am obsessed with it. you should listen to it bc it makes me want to cry. This year is finally over!!! i think i'm okay to say i'm OFFICIALLY a junior now! that means i'm half way done with high school. it really did fly by. i feel like i was a freshman like two days ago. last night me and some of my friends went to the 8th grade graduation at our little jr. high alma mater. then we went to my friends house and partied with them. it was a dance party for them, but we mostly stayed upstairs and played rock band, which i dominated on. it seems kind of like every year the incoming freshman are getting smaller and smaller. like i feel really small for a junior, but the 8th graders last night were like 6th graders. so weird. next year will be so nice because my brother can drive me to seminary and every other place i want him to. i don't get my license till february, but i think my mom will make him drive me around till then. i have one week of summer before i go to girls camp. idk what i'll do w/o my blog for a week. oh well, i get to be with my "little sisters" and our unit is the 12 Dancing Princesses. i'll take some pictures because we've gotten them some cute stuff. Tomorrow is my last day of school! this week has been pretty crazy. i took my history and english final and did pretty well on my english, and got a 106% on my history. crazy. my dad helped my study and remember weird names like menachem begin. i had ZERO finals today because i A-passed my spanish because i have a 107% percent in the class so i think i deserved it, and i had choir. ugh tomorrow is my biology and algebra 2 final and i am NOT excited about either. technically i'm a-passing my biology final because i can still take it and try to raise my B+ to an A, but if it hurts me it wont count, so thats pretty cool. i'll probably do terrible on my math final, but i will try to do my best. i am so excited for summer, i'm trying to get a flight out early to utah, but they're so dang expensive and i need a new phone and i have limited mula. so i guess i'll just have to see what happens. the lakers play tonight! i'm so excited, i've missed them this past week.